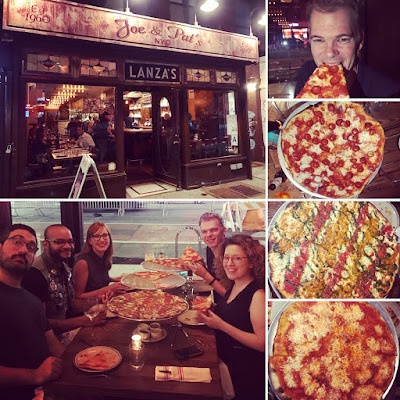 A New York pizza story. In 1924, an immigrant named Antonio Pero left his steady job at an iconic pizza institution to open up his own pizzeria called Totonno's in Coney Island. In 1929 and 1933, John Sasso and Patsy Lancieri did the same thing opening John's on Bleecker Street and Patsy's in East Harlem respectively. In 2018, Valentino Gonzalez has followed in this tradition with the opening of Salza Pizza in Woodside, Queens. Whereas Pero, Sasso, and Lancieri apprenticed at Lombardi's, Gonzalez apprenticed at NY Pizza Suprema. In over a decade of service, Valentino learned everything from dough preparation to masterful presentation from owner Joseph Riggio. His ability to take in all that knowledge and then perform it at mind-blowing speeds during a Friday lunch rush put him in a class of his own. Valentino's self-taught dough acrobatics add even another dimension to his abilities. But now, he faces his biggest challenge yet: management. Not surprisingly, the pizza at Salza Pizza is one of the best constructed in the city. Complete with a creamy blend of Grande mozzarella and hand-grated romano cheese, the thin-yet-sturdy deck oven Salza Pizza crust reminds you what is great about the quintessential New York street slice. 1. Katey recently lost several baby teeth and received $12 from the tooth fairy. She also likes cheese. 2. Lorina Ladrillono never shows up to pizza month empty handed. Not only did I get a card but she gave it to me while wearing a Really Into Pizza (RIP) tshirt.